The Conservatives have gained a 3-point lead over Labour despite a strong showing by Jeremy Corbyn’s party at their conference this week. Opinium’s Weekly Conference Tracker shows support for Labour fell by 3 points following the conference, while the Conservatives gained 2 points. The decrease in votes for Labour is primarily a result of losing favour amongst Remainers in the last week – with support falling from 53% last week to 50% this week. However, Jeremy Corbyn’s rousing performance in Liverpool served some personal success, and his net approval rating marginally increased from -21% last week to -18% this week. 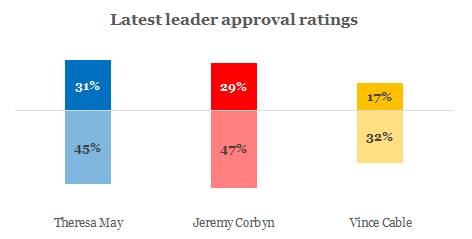 Despite Corbyn stating this week that Labour are ready for government, this is not what most of the public think. Labor’s ratings are either the same or a little it worse than this time last year. If a public vote was held after a Brexit deal was agreed, 39% of the public think that the options on the ballot paper should be between leaving on the terms of the exit deal vs. leaving the EU without a deal, rising to 63% of Conservative voters. The Labour Party Conference was dominated with conversations about holding a People’s vote with different views on what the options in the vote should be. Twice as many Labour voters think that the options in a public vote should be between leaving on the agreed deal and remaining in the EU, compared to leaving on the agreed deal and leaving the EU without a deal (50% vs 25% respectively).